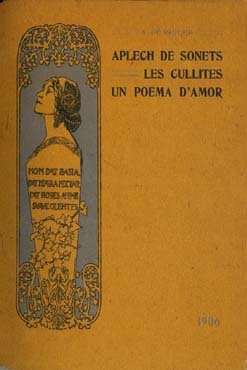 Alexandre de Riquer primarily composed poems. We discuss here his basic works, omitting his ample correspondence with his family and with other artists of the era. 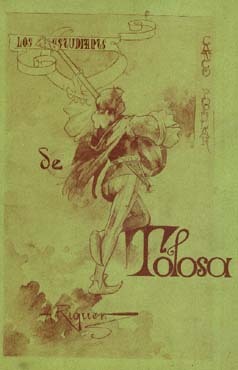 Symbolism appeared on the Catalan poetry horizon in 1893 and is counted among the currents contributing to the literary world of the Art Nouveau period. Santiago Rusiñol and Raimon Casellas in particular gave an important impulse to this new aesthetic. One example is Casellas’s “La damise?la santa”, which exhibits clear pre-Raphaelite qualities. In the waning years of the nineteenth century, the most active followers of the Art Nouveau immersed themselves in the political evolution that resulted in a considerable resurgence of Catalan identity. A combative poetry opposed to Symbolism’s abstract idealism emerged as a result. The impact of the theories of John Ruskin and his invigorating vision of nature influenced not only Alexandre de Riquer, but also Maragall and other writers of this period. According to Eliseu Trenc, Riquer was already writing verse at the age of nineteen. 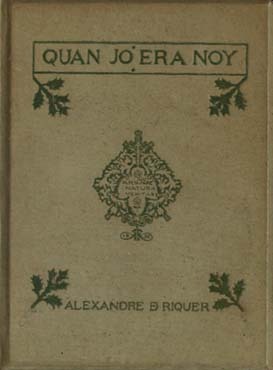 He developed his poetic prose in “Quan era noy” (“When I Was Young”) and entered lyric poetry with “Cristantemes” (“Chrysanthemums”), a decidedly Symbolist work containing not only free verse, but also some illustrations of images elaborated in his text. This theme continues in “Anyoranses” (“Yearnings”) and “Un poema d’amor” and culminates in “Petons” (“Kisses”), in which the unity of love is contrasted with the pain of separation and death. Riquer evokes in his poetry the image of a woman-fairy that represents the eternal feminine. His first book of poetry, “Anyoranses”, is a song to his absent wife and the impossible love that can be attained only in Paradise, after death. In this work appear themes previously elaborated by Dante and the pre-Raphaelite Dante-Gabriel Rossetti. In “L’Aplech de Sonets” (“Assembly of Sonnets”), Riquer speaks of days gone by and the lost life of love, while in el “Poema del Bosch” (“Forest Poem”), a devastated Nature laments the loss of youth. These concepts gave rise to an exaltation of the individual as the fount of poetic creativity and a belief that the author must liberate his emotions regardless of imposed social conventions. This current, termed “Spontaneism”, appears in Joan Maragall and Carles Riba and was linked to the pre-Raphaelitism which so heavily influenced Riquer – particularly its emphasis on popular legends and the Middle Ages. Riquer was well-acquainted with the world of the Renaissance Quattrocento (Dante, Petrarch) through pre-Raphaelite literature. The prevalence of pre-Raphaelite themes and motifs is evident in the pages of the journal Joventut, with which Riquer actively collaborated around 1900 (the year Ruskin died), devoting space to Parnassian and Decadentist trends and joined by other poets including Jeroni Zanné (1873-1934) and later by writers such as Miquel de Palol (1885-1965) and even Guerau de Liost. Alexandre de Riquer’s poetry, as did that of other poets, evolved toward an ever more cultured and classical and at the same time Intimist poetic language obvious in his later poems. No discussion would be complete without mentioning the “battle of the sonnet” that raged at the end of the nineteenth century, in which Riquer found himself inevitably involved. Led by the “New Pleiades” group, it championed the sonnet as the most sublime form of poetic expression.